Apple just announced the iPad Pro 10.5-inch to slot in above the iPad Pro 9.7-inch. There's also a new version of the iPad Pro 12.9 with the same core spec as this new size version. Clearly Apple sees that saturating the 'pro' tablet market is the way to go. Naturally the new tabs have support for Apple Pencil and the Smart Keyboard. The new iPads support HDR video, now a common feature in high-end mobile handsets like the LG G6 and tablets like the Samung Galaxy Tab S3. Again the display is TrueTone. The new A10X CPU features 30 percent faster processor performance than the A9X and 40 percent faster graphics performance, according to Apple's usual keynote-style figures. 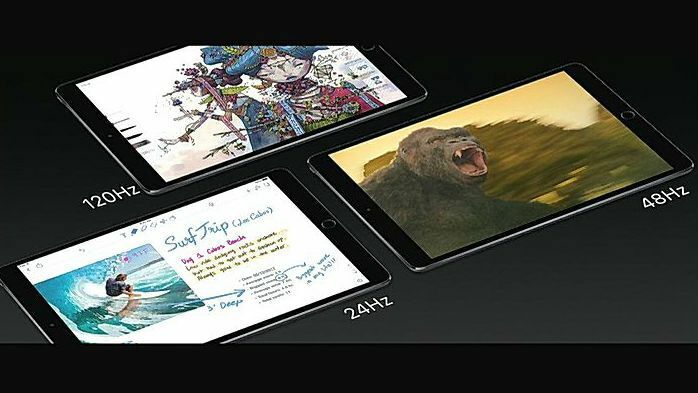 Apple introduced the original 12.9-inch iPad Pro in September 2015 when it also introduced the Apple Pencil and Smart Keyboard. The 9.7-inch iPad Pro followed in March 2016. — deeper integration with Apple Pencil, with support for inline drawing to write along text in Notes and Mail, Instant Markup to easily sign documents, annotate PDFs or draw on screenshots, and a new Instant Notes feature, which opens Notes from the Lock Screen by simply tapping Apple Pencil on the display. New searchable handwriting makes it easy to search for handwritten text or characters.